Ironmaster David Thomas, circa 1860. The Pennsylvania iron industry was built on the skills and technological expertise of British immigrants. Indeed, Thomas Rutter copied British furnaces when he constructed Colebrooke Furnace in the early 1720s, the first charcoal-iron furnace in Pennsylvania. In the 1830s, the switch from charcoal to hot-blast anthracite furnaces was led by another English immigrant, David Thomas. For centuries, British iron makers used wood-based charcoal to fuel their furnaces. As British forests became depleted, however, they turned in the 1700s to bituminous coal, which they “cooked” or reduced to yield a longer burning, cheaper high-carbon as furnace fuel high-carbon substance called “coke.” Anthracite coal offered a potentially even better fuel for iron making, but required intense heat to burn it. The technology to create that heat was developed by Scotsman James B. Nielson, who in 1828 patented an apparatus that recycled hot gases blown out the top of an iron furnace back into the furnace, preheating the air blast and raising the temperature inside the furnace. Soon afterwards, George Crane, owner of Yniscedwyn Iron Works in Wales, and his plant manager David Thomas, who had been conducting his own unsuccessful experiments with anthracite furnaces, constructed an improved "hot-blast" furnace that maintained temperatures previously unthinkable for iron makers. The result was a boom in European iron production and jealous interest from Pennsylvania manufacturers who had easy access to anthracite. Pennsylvania ironmasters had been slow to adopt bituminous coal and coke as a fuel, in large part because of the abundant supply of wood in the forests of central and western Pennsylvania. Wood shortages in the Commonwealth and the presence of the huge anthracite deposits in northeastern Pennsylvania motivated Commonwealth ironmasters in the 1830s to begin their own experiments with anthracite hot blast technologies. After initial attempts to put a furnace into blast with anthracite failed at his Pioneer Furnace, hired Benjamin Perry, a former furnace manager in Wales who was familiar with both coke-fired and anthracite furnaces. Pioneer Furnace had its first success with an anthracite furnace in 1839. Soon, four other anthracite furnaces went into blast at furnaces at Danville, Roaring Creek, Phoenixville, and Columbia. All of these furnaces, however, had problems that ranged from managerial to structural. In the summer of 1838, Josiah White and Erskine Hazard, founders of the Lehigh Coal and Lehigh Navigation Company, read about the Crane and Thomas’s successes at Yniscedwyn. In 1839 they journeyed to Wales where they signed David Thomas to a five-year contract to introduce hot-blast iron making to the Lehigh Valley. After Thomas arriving in Catasauqua that June, the Crane Iron Company was immediately organized, and Thomas oversaw the erection of a new anthracite furnace. Thomas faced many difficulties in building the furnace and scalding skepticism from other ironmasters. One charcoal ironmaster remarked that "he would eat all the iron Mr. Thomas made with anthracite coal." He would soon eat his words, if not the coal. 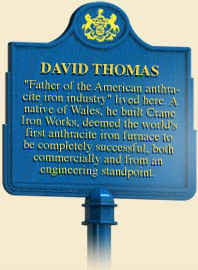 On July 4, 1840, Thomas "blew in" the first sustained commercial anthracite iron furnace in the U.S. For this success, he earned the title of the "Father of the anthracite iron industry." The Crane Iron Works, Catasaqua, PA, circa 1860. Commonwealth ironmasters may have lagged behind their British counterparts in technological innovations in the early 1800s. During the 1840s, however, they started to catch up and in critical areas surpassed them. The most important of these advances was introduced by another Briton, John Fritz, who introduced the three-high rolling mill in 1857. Prior to Fritz, workers in rail mills passed red-hot iron repeatedly between two grooved rolls that gradually shaped the iron into rails. The rolls shaped the iron going only in one direction; workers had to pass the iron back over the rolls to be fed into the rolls again. Passing the iron back over the rolls allowed the iron to cool off, making it harder to produce quality rails and forcing workers to reheat the iron. Adapting a process already used to shape smaller iron products, Fritz's developed a “three-high mill” at the Cambria Iron Works in Johnstown, putting another roll on top so that workers could pass the iron through the rolls going in both directions. After his success at the Crane Iron Company, Thomas in 1854 built two first furnaces of his own Thomas Iron Works at Hokendaugua, about a mile from Catasauqua. By the mid-1870s Thomas, according to the New York Times, “ranks among the very foremost iron manufacturers in the world.” In addition to his six furnaces at Hokendaugua and two at Lock Ridge, he had invested in coal mines, ore beds, other anthracite blast furnaces in the area, a rolling mill, and other iron enterprises. 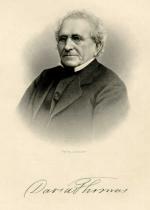 A revered figure in the iron industry and in his adopted home of Catasauqua, “Father Thomas,” as he was known, died there, at the age of eighty-eight, in 1882. Craig L Bartholomew and Lance E Metz, The Anthracite Iron Industry of the Lehigh Valley. (Easton: Center for Canal History and Technology), 1998. Gerald G. Eggert, The Iron Industry in Pennsylvania (Harrisburg: Pennsylvania Historical Association), 1994. Charles Rhoades Roberts and al et, History of Lehigh County Pennsylvania (Allentown, PA: Lehigh Valley Publishing Company), 1914. James M. Swank, History of the Manufacture of Iron in All Ages. (New York, NY: Burt Franklin), 1892. Peter Temin, Iron and Steel in Nineteenth-Century America: An Economic Inquiry (Cambridge: The M.I.T. Press), 1964.